Most precious metals moved lower in their start to the new trading week. Palladium was the exception. Losses in gold and silver were their second in a row after the pair had climbed for five straight sessions to mark multi-month highs. Gold for April delivery declined $2.80, or 0.2%, to settle at $1,319.30 an ounce on the Comex division of the New York Mercantile Exchange. Gold retreated on the day as the U.S. dollar gained, opined analysts. 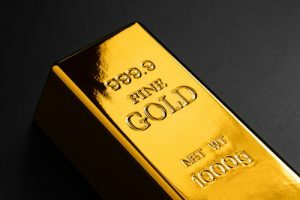 "U.S. securities and bonds are yielding so much more than the rest of the globe, so global investment is coming to the U.S. … The dollar is in demand with gold taking a backseat," Reuters quoted George Gero, managing director at RBC Wealth Management. Gold futures ranged from a low of $1,312.70 to a high of $1,323.60. They moved up 1.9% last week. On Thursday, they settled at their best price since April 24. Silver for March delivery gave back 4.5 cents, or 0.3%, to end at $15.886 an ounce. Silver futures traded between $15.68 and $15.94. They gained 1.5% last week. On Thursday, they marked their best close since July 10. April platinum fell $3.90, or 0.5%, to $822.80 an ounce, ranging from $816.40 to $829.70. Palladium for March tacked on $16.80, or 1.3%, to $1,330.40 an ounce, trading between $1,306.60 and $1,336.40. Last week, platinum rose 1% and palladium shed 0.5%. Gold declined $6.55, or 0.5%, to $1,312.15 an ounce. Silver dropped 26.5 cents, or 1.7%, to $15.75 an ounce. In LBMA results last week, prices rose 1.9% for gold, 4.1% for silver, 1.6% for platinum, and 2.8% for palladium. United States Mint bullion sales were unchanged as of 3:49 p.m. EST. Below is a sales breakdown of U.S. Mint bullion products with columns listing the number of coins sold during varying periods.